It's the start of my third week here, and I thought I'd share some scenes from a Monday at Itipini. Today a truck came to pick up the cardboard that members of the recycling crew here have been collecting for the past few months, and will help generate income for one of the new sustainability projects in the community. Some of the kids worked in the garden this afternoon to get it ready for new Spring plants, and the preschoolers enjoyed an afternoon snack. Work in the clinic has been going well so far, and it's nice to start recognizing patients, staff, and other community members. My basic Xhosa is starting to improve too, and my first official language lesson later this week will be very welcome. Thanks for stopping by, and peace. Here was the view from my window as I arrived in Johannesburg last Sunday. It's hard to believe I've been here almost a week, and there's already so much to tell. After a nearly 16 hour plane ride from Atlanta to Johannesburg, I was greatful for a restful night's stay at the Afton Guest House. 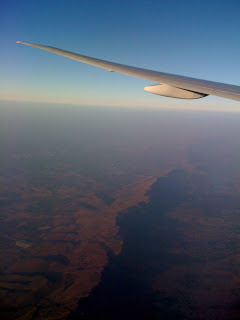 Then it was up for an early morning flight to Mthatha. Jenny McConnachie, who is the nurse I will be working with this year at Itipini, met me at the airport and since then has been my guide for the week. Monday through Friday I spent my days in Itipini, where I have been able to meet some of the community. Most of my time thus far has been helping out in the clinic by finding patients' medical cards, packing pills, logging treatments for the day, and helping give TB patients their daily regimens. Tuesday is baby day at the clinic, and there were nearly 70 babies and mothers treated by Jenny and Sister Dorothy who are the two nurses on staff at the clinic. One of the highlights of my morning is going to prayers at the preschool...this usually entails a hundle of little ones standing in a circle outside singing, clapping, and dancing as the teachers lead them in song. It can't help but make me smile, and hope that one day soon I'll know the Xhosa words so that I can join in with them. Other highlights of this week have included dinner at Jenny's house on Thursday with an American volunteer who works at Beford Orthopedic Hospital as a physical therapist and a South African medical student here in Mthatha. Jenny hosts these weekly at her home for volunteers. It was a great time to relax, enjoy some tasty lasagna, and have some good conversations (somehow we managed to cover topics from the ongoing strikes at local schools here in Mthatha to Dolly Parton). Grocery shopping was another fun adventure at the local SuperSpar, and today I had my second try at driving a stick shift...although I have to admit driving on a new side of the road and with taxi drivers who generally pay little attention to others on the road, made it a little trickier. I've got a year to get it down though, and I hope to at least semi-master the roads of Mthatha by then. All in all it's been a really good first week here. I'm learning a lot about the African Medical Mission, and I'm seeing how my role here will take shape for the coming year. The rondavel where I'm living at Bedford Hospital is really nice, and I'm getting the hang of knowing when the water is on and off...and when it's hot. Jenny has been such a help in getting me oriented, and I look forward to being able to explore more of Mthatha and South Africa on my weekends off. There's much more to come, and I hope to have pictures from Itipini, Mthatha, and Bedford Hospital up soon to give you more of a glimpse into my live in Mthatha so far. I can't believe it, but tomorrow is the big day. I'll leave in the afternoon from Chattanooga for Atlanta then it's on to Johannesburg. After a short stay overnight, I'll arrive in Mthatha early morning of September 13th. Wow. I've had wonderful send offs from Chattanooga, Atlanta, and Sewanee that have included a bonfire, a commissioning, a sermon, pool side chats, Thai food, and porch sitting. Today I have some time to spend with my parents, run my last errands, play with Lou the dog and Max the cat...oh and finish up this packing business.